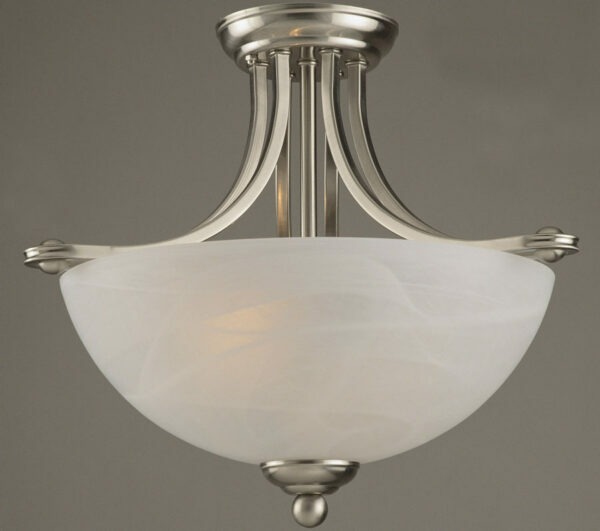 The Texas semi flush 2 lamp Art Deco style ceiling light in satin nickel finish features 1920’s chic, with double curved arms and marble effect glass dish uplighter shade. Suspended from a wide ceiling rose this contemporary light fitting is a spectacular ceiling light feature with all the grace and charm of the Art Deco era. If you are searching for a ceiling light for a room with a low ceiling with grace, charm and Art Deco influences you have found it. Part of the Texas Art Deco lighting collection which includes two chandeliers and a wall light; please see below. A prestigious lighting range with style, quality and impeccable detail.